Armand began his coaching career at the world famous Nick Bollettieri Tennis Academy at the age of 25. He’s trained world class professionals such as Jimmy Arias (#5 ATP), Aaron Krickstein (#7 ATP), Amy Frazier (#13 WTA) and Carrie Cunningham (#33 WTA). He also worked with top juniors Andre Agassi, Jim Courier, and David Wheaton among others. He served as Head Professional at the NBTA in Japan for four months. His students have captured in excess of 60 USTA National Championships. He was awarded the 1991 USPTA (United States Professional Tennis Association) National Touring Coach of the Year for his work with Frazier and Cunningham. 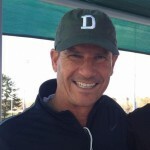 In 1996, Armand was named USPTA Michigan Pro of the Year. As one of the most decorated coaches in the midwest section, Armand has been named Junior Coach of the Year Five times.